A Pacific Northwest adventurer and transportation pioneer, Vern Centennial Gorst was born on August 18, 1876 in Minneapolis, Minnesota. In 1888, the Gorst family relocated to the Kitsap Peninsula in Washington State. From an early age, Gorst displayed an entrepreneurial spirit and a fascination with transportation. He began his first transportation business at age 13, moving chickens across Port Orchard bay using a log raft he had constructed himself. As a young man, Gorst spent several successful years prospecting in Alaska during the gold rush. Later he returned to Puget Sound to invest his gold earnings in the arena of transportation. Over the next several decades, Gorst set to work building a number of transportation companies, with his focus eventually shifting to aviation when, at age 38, he became a self-taught pilot. In 1925, Gorst's interest in flying won him a bid for the first contracted airmail service between Seattle and Los Angeles, and Pacific Air Transport was born. 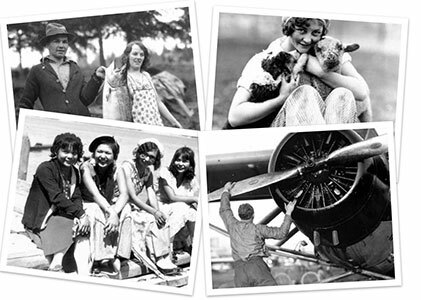 Gorst continued to be an entrepreneur of aviation, starting Seattle Flying Service in 1928, and creating other airline companies including Gorst Air Transport in 1929, Barnes and Gorst Air Mail, and Victoria Air Mail. Vern Gorst died in Portland, Oregon in 1953.